Predation by the introduced brown tree snake resulted in the extinction of most of the native species of Guam. Birds of the nearby Northern Mariana Islands may face the same fate as the snakes become more widespread and exacerbate species declines already underway owing to habitat loss. The brown tree snake Boiga irregularis has decimated bird populations on the Pacific island of Guam since it was accidentally introduced after the second world war (Fritts and Roda 1998). 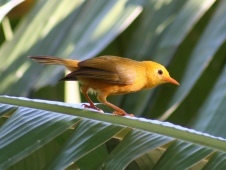 Its exceptional predatory abilities and lack of natural enemies on Guam have resulted in the extinction of 12 of the island’s native bird species and huge population declines of eight more (Wiles et al. 2003). The snake has more recently become established on several of the nearby Northern Mariana Islands, leading to a number of species being reclassified as Critically Endangered because they are predicted to suffer extremely rapid population declines in the near future. Particularly at risk are those species whose populations have already shown a marked decline owing to extensive habitat clearance to accommodate U.S. military personnel. Mariana Crow Corbus kubaryi is one such species: the recent introduction of brown tree snakes to Rota is likely to speed up the species’s already rapid decline caused by habitat loss and predation by rats. Rota Bridled White-eye Zosterops rotensis is in a similar situation: found only on Rota, it has declined by 74% between 1989 and 1999 as a result of habitat loss. Other examples are Golden White-eye Cleptornis marchei which had an estimated population of 55,500 individuals on Saipan in 1982 and it was found there in extremely high densities in 1991–1992 (up to 2,095 birds/km², Craig 1996), but the total population has since declined to approximately 9,000 birds in 2000–2001 (an apparent decline of 84%). Nightingale Reed-warbler Acrocephalus luscinius is restricted to the islands of Saipan, Aguijan and Alamagan, where the population is relatively small (around 4,500 individuals) and has already seen a 61% decline between 1982 and 2007 driven by habitat loss and degradation. The emerging threat from the brown tree snake on these islands has the potential to exacerbate the already continuing declines in the endemic bird populations. The combined threats of habitat loss and invasive species must be tackled in unison, and soon, if further avian extinctions are to be avoided in the region. Craig, R. J. (1996) Seasonal population surveys and natural history of a Micronesian bird community. Wilson Bull. 108: 246–267. Fritts, T. H and Dodda, G. H. (1998) The role of introduced species in the degradation of island ecosystems: a case history of Guam. Ann. Rev. Ecol. Syst. 29: 113–140.